Technical Analysis and Elliott Wave Theory: South Africa! Well, the most exciting thing yesterday was actually that we qualified for the World Cup in South Africa with a not so exciting 0-0 versus Israel. 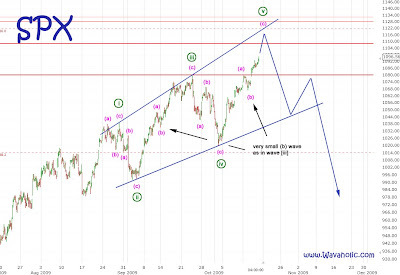 SPX: Last Friday, I said that I expected wave (b) to be very small, and that's what we've got: wave (b) barely retraced 23,6%. Now, the market is somewhere in wave (c) which should end very soon, possibly early next week.